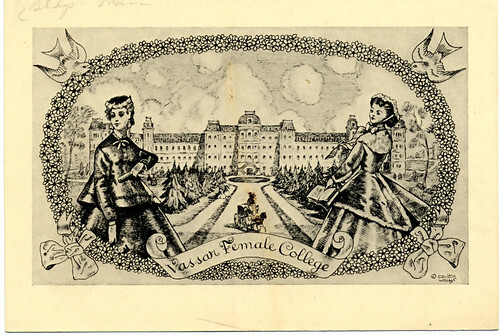 Shortly after Vassar Female College was founded by Matthew Vassar and was incorporated on January 18, 1861, Mrs. Sarah Josepha Hale, "editress" of Godey's Lady's Book, put her considerable weight in public opinion behind the college. She was the moving spirit of the most popular American women's journal of the mid-nineteenth century and was thus in a position to bring in students and to overcome skepticism about what some considered a very dubious enterprise: offering to women the same educational opportunities as those available to men at places such as Brown and Harvard. In his Vassar, the Remarkable Growth of a Man and His College, a book that I edited and the college published, the late Vassar professor Edward R. Linner pointed out a wonderful exchange of correspondence between Sarah Josepha Hale and Matthew Vassar, as well as "seventeen notes or editorials" in the columns of Godey's Lady's Book dealing with Vassar Female College. This exchange of letters between Mrs. Hale and Vassar, and a later one, between Mrs. Hale and the college's original trustees, led to the removal of the word "Female" from Vassar College's name. Between 1860 and 1865, the correspondence between Hale and Vassar (which can be consulted in Special Collections) took up uniform dress for students, which Mrs. Hale was against, and the subjects of the college calendar and a three month vacation between December and April, which Mrs. Hale also opposed. The use of the word "Female" in the title of the college turned into a crusade. Linner finds Hale's antipathy to the word amusing since she herself in her columns before 1855 had spoken of "female vanity," "female intellect," and "female immigration." But now she had turned against the word as being "inelegant" and "absurd." She felt that the college should be called "Vassar College for Young Women." By June 1863. The board of trustees had appointed a committee to look into this whole matter, and in February 1864, Vassar wrote Mrs. Hale that the trustees were deliberating. In June 1865, before the opening of the college, the subject came to a vote but did not pass as too many trustees were undecided. Finally in 1866, the board did pass the change. In February 1867, the New York State Legislature removed the word "female" from the name of the college and the trustees voted to remove the marble slab engraved with this word from the front of Main Building. According to the architect for the restoriation of Main in 1960, upon the removal of "Uncle Fred's Nose," the slab turned up again from a burial spot in the ground in front of Main, but it is nowhere to be found now. What was this all about? Why was the word "female" considered so vile when applied to a college? My guess is the influence of Darwin's Origin of Species. If you've ever read that work, replete with detail on the male's pursuit of the female, you will know what I mean. Margaret Wright, Emerita Professor of Biology, suggested in her study of Darwinian theory in the classroom, Nineteenth Century Natural History at Vassar College, that there was mixed acceptance of Darwinian theory at Vassar in 1865. We see, then, that the board of trustees felt the semantic repercussions from Darwinian debate as they withdrew a critical word from the original title of the college. Linner, Edward R. Vassar, the Remarkable Growth of a Man and His College," Poughkeepsie, NY: Vassar College Press. Wright, Margaret "Nineteenth Century Natural History at Vassar College." Poughkeepsie, NY: Vassar College Press, 1989. This article was originally written for Vassar Spectator, The Journal of Neglected Studies, Spring 1996, Vol. X, no. 4.